There are physical aspects of attending Burning Man that may require some preparation for those of us who are in the 55 and over category: specifically, walking and biking. If you’re not in the habit of getting around without the aid of a powered vehicle, you might find yourself physically exhausted before you’ve had a chance to see much of what Black Rock City has to offer. It’s around 4 miles from one end of the city to the other, and the total circumference of the circle that makes up BRC is approximately 8 miles. It’s possible to see everything by foot, but the time and effort required is substantial. 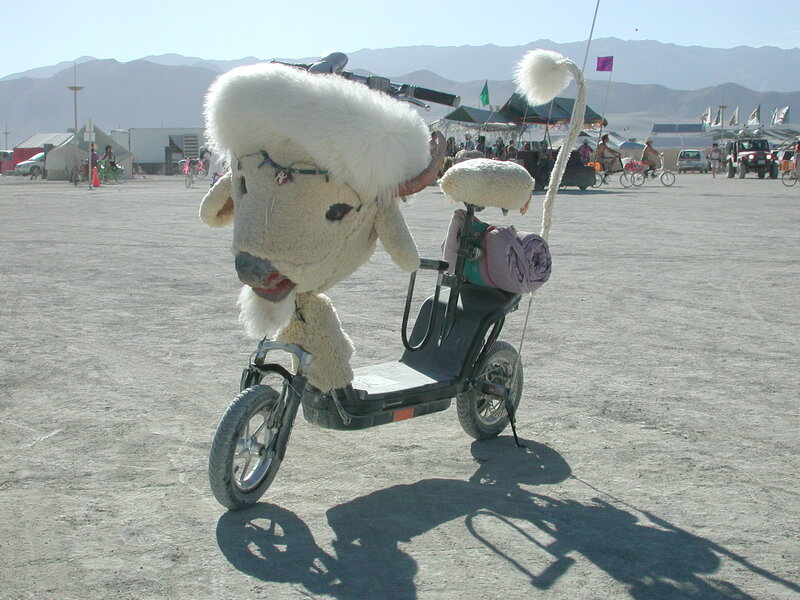 Only a small number of motorized vehicles are permitted to drive on the Playa, and their speed is limited to 5 m.p.h. Authorized vehicles include “art cars” that have been approved and licensed by the DMV (Department of Mutant Vehicles), and golf carts and trucks that are part of the Department of Public Works (DPW) fleet. For most people, bikes are the best means of getting around, but keep in mind that it can take from 30 to 45 minutes to drive across Black Rock City. While much of the Playa surface is flat and hard, there are always areas where the gypsum that makes up the Black Rock Desert is loose and can create some tough biking situations. So if you haven’t been on a bike in awhile, it’s my strong recommendation that you get your biking muscles into Playa condition before making your way to Burning Man. By the way, power assisted bikes are also allowed on the Playa – but not Vespa-style scooters or motorcycles. Most vehicles that people drive to the Burn must be left parked from the time you arrive to the time you depart. Whether you have a bike or not, you’re bound to do a lot of walking at Burning Man, so it wouldn’t hurt to strengthen your leg muscles or at least do a little more walking then usual as the time for the Burn approaches. Also, keep in that the Black Rock Desert is about 4,000 ft. above sea level, and while that’s not quite the height of Donner Summit for those of you who cross the Sierras (7,200 ft.) on the way to Burning Man, it’s still above the level at which most of us live day-to-day. When you’re living at altitude, you can suffer greatly if you don’t consume enough water and electrolytes (unfortunately, alcoholic and caffeinated beverages don’t help keep you hydrated). Never venture out without water or a sports drink, lest you suffer from dehydration — the top reason that people end up in one of Burning Man’s medical tents. There’s no need to put yourself through a rigid physical fitness routine or join a gym to get ready for Burning Man, but if you come to the Playa having spent the prior few months strictly as a couch potato, then you might not have the energy to experience the Burn to the fullest possible extent; and you might just find yourself struggling or suffering through an accident as you try to re-learn how to ride a bike only after you reach the Playa. You simply want to avoid unnecessary stress on your body during your week in Black Rock City, and be able to ride your bike with control and ease. So just take a few minutes everyday to walk, ride a bike and stretch your body.